Luke Burgis is Entrepreneur-in-Residence at the Ciocca Center for Principled Entrepreneurship at The Catholic University of America in Washington, D.C. After a brief career in investment banking and private equity, he started his first company at age 24 and was named a “Top 25 Entrepreneur Under 25” by Business Week for growing it into one of the most innovative food access businesses in the country. Luke is also the founder of two more startup companies that he led as C.E.O. to high growth and sustainability. FitFuel.com, the e-commerce company that he founded, was recognized as having an outstanding company culture. He formed a close partnership with Zappos.com, merging shipping operations and developing a program for personal development. Luke is now a recognized Catholic entrepreneur whose most recent ventures integrate Catholic Social Teaching and have a strong social and cultural mission: ActivPrayer, which is a sports and fitness brand animated by a Christian understanding of the human person, and Inscape Vocations, which is building a culture of vocation by equipping adult mentors to help the young people in their care discover, embrace, and live out their unique, personal vocations. 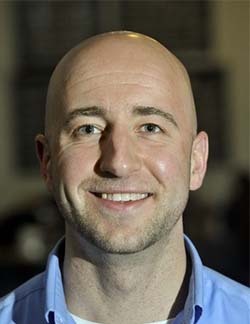 Luke is co-author of the book Unrepeatable: Cultivating the Unique Calling of Every Person (Emmaus Road Publishing, 2018). He has a B.S. from the Stern School of Business at New York University and an S.T.B. in Sacred Theology from the Pontifical University of the Holy Cross.